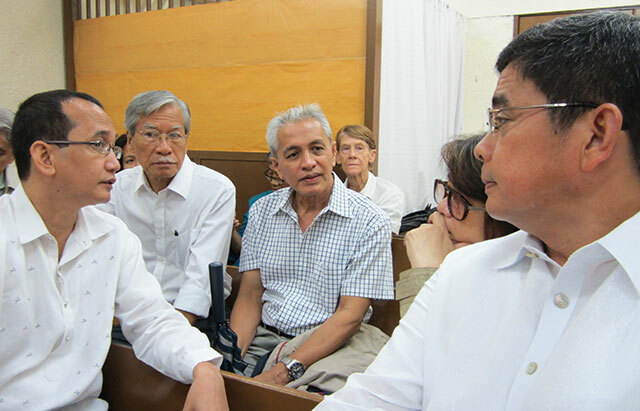 MANILA – Human rights group Karapatan warned that the arrest of peace consultant Vicente Ladlad is a grave violation of the Joint Agreement on Safety and Immunity Guarantees (JASIG), a peace agreement signed between the Philippine government and the National Democratic Front of the Philippines – Negotiating Panel. Ladlad, a peace consultant of NDFP, was reportedly arrested late in the evening of Nov. 7, along with elderly couple Alberto and Virginia Villamor, in Brgy. San Bartolome, Novaliches, Quezon City. Quezon City executive judge Cecilyn Burgos-Villavert issued a search warrant against Ladlad and two others with aliases of “Kuya Tony” and “Ate Anna” on Nov. 6, saying that they were found in control and in possession of firearms and ammunitions, per the police. Two other peace consultants, Rafael Baylosis and Adelberto Silva, were arrested on separate incidents since the termination of the peace talks between the NDFP and the Philippine government. “We are warning the Philippine National Police and the Armed Forces of the Philippines to desist from planting evidence against Ladlad and companions, as they have grown accustomed to justify the arrest and detention of peace advocates, rights defenders and civilians, based on trumped up criminal charges,” Palabay said, adding that state security forces have done the same against arrested activists and dissenters. The military hates peace talks and peace talkers !!! Why? Because they make no money out of it !! !